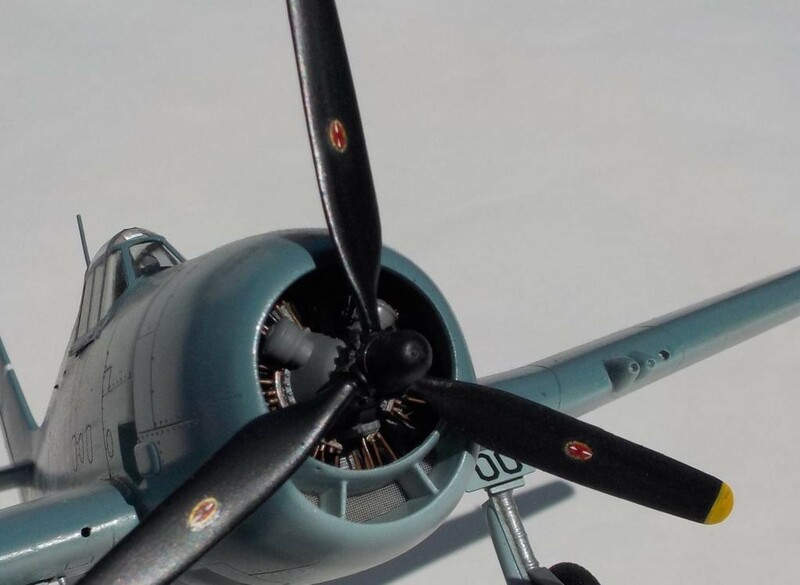 Hellcat F6F-3 early Flatley double nuts. Here is another recent completion, a combination of an Eduard fuselage, and Hasegawa wings/tailplane. I had a spare fuselage that came with the Eduard kit I bought when the Eduard Hellcat first came out. I didn’t want to let the parts be consigned to the spares bin, so I put out a request on a modelling sight for 1/48 Hasegawa F6F wings- I thought maybe someone used the Dangerboy wingfold set on theirs and wouldn’t need the wings. So, when someone responded I couldn’t believe my luck. I had to tweak the Hasegawa wing parts at the front to match the Eduard fuselage, but other than that it was a pretty close fit. I then had to fashion the gun fairings from spare Hasegawa 1/48 F6F-5N parts (I am partial to Hellcat night fighters for some reason!) I wish I had taken pictures of the mods needed but was so determined to finish this kit this past February Break, that I neglected to document it. The Hasegawa tailplanes fit the Eduard fuselage fairly well with some filler. I also used a modified resin F3F rudder to take the place of the Eduard rudder part. I used a Hasegawa engine and wired it up. I used a resin copy of an Otaki Hellcat cowl lip affixed to the Hasegawa cowl part. I used a gauze teabag to replicate the mesh in the chin portion of the cowl lip. i also had to use an Obscureco resin propeller. I used the Eduard “closed” canopy. I also used the Hasegawa kit cockpit which fit more easily into the Eduard fuselage than I thought. 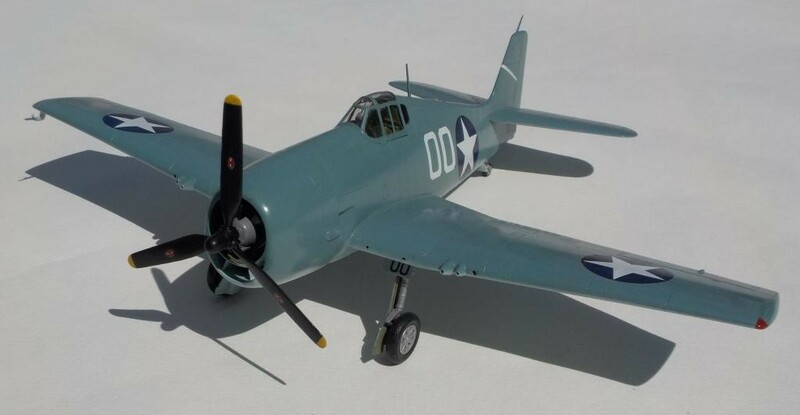 I had always wanted to build an early F6F-3 with the initial production gun fairings in my Hellcat herd, and Flatley’s double nuts was the one I wanted to model. So, I put out a request for spare Hobbyboss kit decals, which have #03 from the same squadron and time frame. That meant i needed two sets (for four zeros), and fortunately, 3 years after I had planned this build, I got decals that fit the bill. I had to carefully slice them up as Hobbyboss rendered the line weights too wide for the fuselage numbers. After thinning them to be accurate to my references, I finished up with spare USN stars and black 0’s, and a hand painted stripe on the tail. 5 additional images. Click to enlarge. Got finished (finally) this past February break. Sat for a while before that. Lately, I have been wanting to move my partial builds out (some call them shelf of doom builds) with a vengeance. I love planes, I love building, but have too many stalled! Where is the fun in that? I blame imodeller for wanting me to get them done! yeah- about a year ago, I got pretty tired of my plethora of incomplete kits! I am trying not to start gluing parts together on any more of my boxed kits- it is very hard! Great work, Dan! 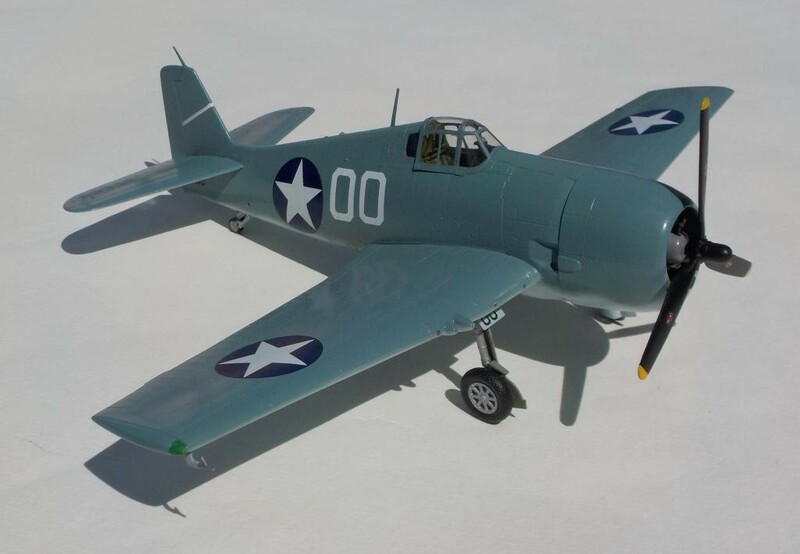 I’m building a 1/48 Hasegawa F6F-5 right now. but I’ve always wanted to do a conversion to the earlier -3 like you did. 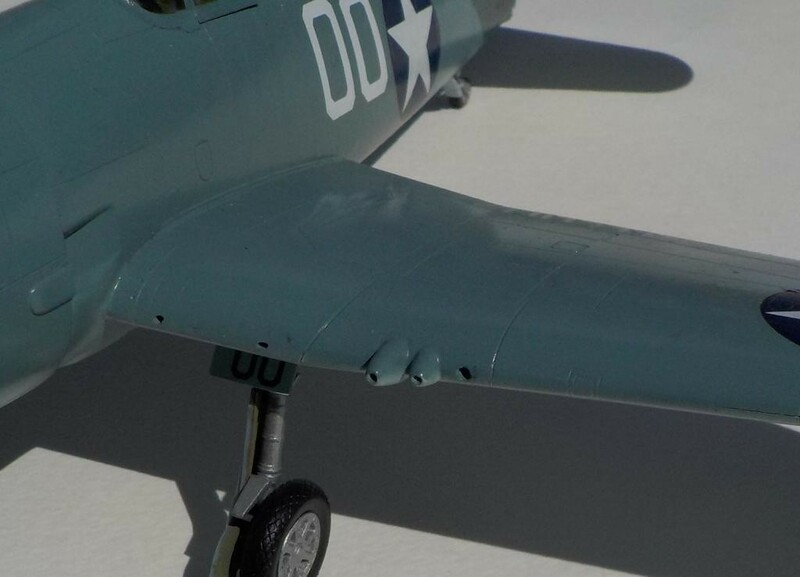 Your scratch-built gun barrel fairings look terrific! Thanks very much Drew. 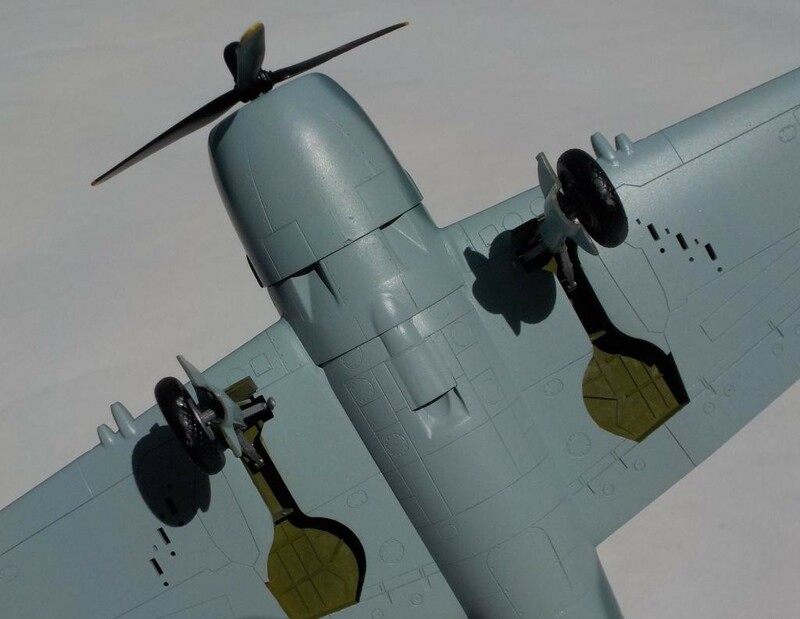 The gun fairings are actually 1/48 Hasegawa F6F-5N gun fairings reshaped according to photos. They have to be pared down a bit, but they work well for the conversion. At some point this summer I want to see if I can do some weathering with exhaust stains, but for now I am happy it is built. Nice Hellcat – different seeing it in the lighter shade. Ditto, don’t usually see the early ‘cats. love the engine detail. You stole my thunder Dan!! Great job Sir!!! thanks for the compliment Frederick! Another interesting build, Dan, keep them coming. Grateful for the input- thanks very much! RAF Fuel Truck 1/35 scale Almost scratch built.